This weekend I was fortunate enough to have my NYC friend, model Rich McKeown, join me as a guest reviewer for Ma’amCakes. Rich has traveled all over the world to model, and shot for brands such as Diesel, Dolce & Gabbana, and Calvin Klein. Over the years, Rich has signed with top modeling agencies Ford Models, DNA Model Management, and is currently signed with L.A. Models. As Grub (located on Seward Street in Hollywood) Tweeted me earlier in the week to try their “Berry, Berry Good Pancakes,” I figured this would be a great spot for our review! Something you may not know about this restaurant is that Grub is actually located inside of a house! 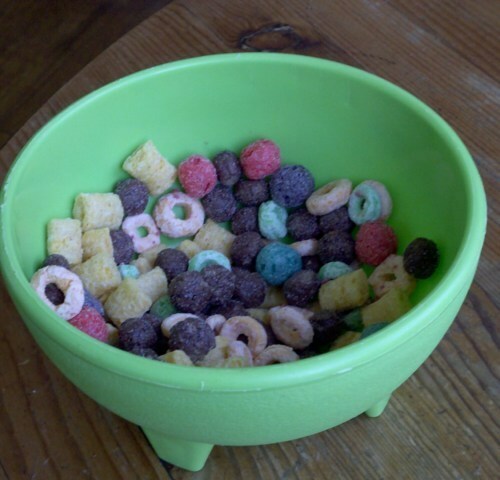 If this isn’t special enough, one of my favorite treats about Grub is that while most restaurants provide bread while you’re waiting for your meal, Grub provides a little bowl of cereal! Those are just a couple of reasons why this breakfast spot is a little hidden treasure in the outskirts of Hollywood. 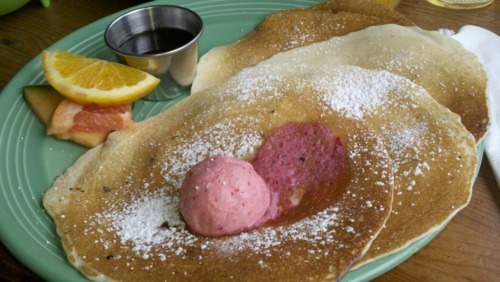 The first thing I noticed about these pancakes, besides the pink butter, was how thin they were. Considering I recently reviewed The Griddle’s thick and heavy pancakes, these pancakes from Grub were almost more like crepes. Personally I like my pancakes a bit thicker – but I definitely recommend these pancakes if you want to eat something a bit lighter and healthier. Rich also commented on the thinness of the pancakes as he said, “Wow these are the thinnest pancakes I’ve ever seen, and they smell amazing.” He continued to point out the colorfulness of the plate saying “Is that sorbet? Or is it pink butter? I’ve never seen that before!” To be honest, neither had I. I referred back to the menu to read that the pink butter is actually Raspberry Butter! “Yeah the butter is semi-sweet, and a delicate treat.” Rich was spot-on with his critiques! And I very much agreed. Nice touch, Grub! Overall the Berry, Berry Good Pancakes at Grub were berry berry good. The ambiance of the plate alone – the fruit, plate, butter, and pancakes – set a colorful palate even before the first bite. When asking Rich what type of pancakes he’d like to see on the menu in the future, he replied “definitely peanut butter.” Up for the challenge, Grub? I very much recommend this unique breakfast spot for your weekend Ma’amCakes, so be sure to visit Seward Street for some excellent grub! Thanks, Rich, for being a part of Sunday brunch with Ma’amCakes!